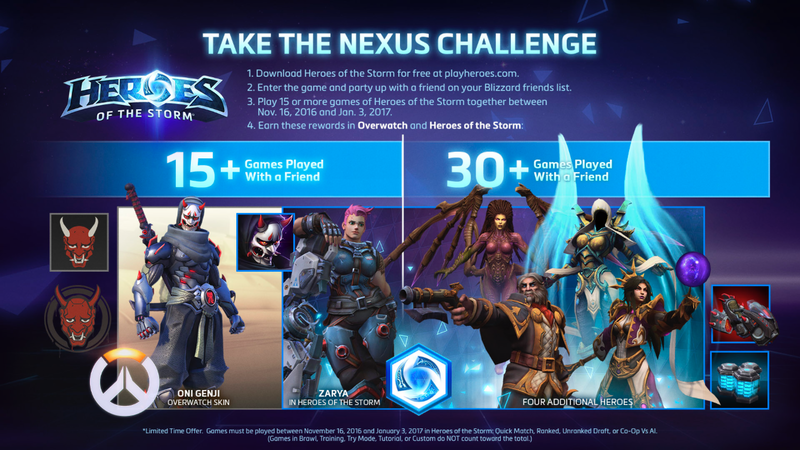 Starting November 15th, Blizzard wants you to take the Nexus Challenge and play Heroes of the Storm! The steps to obtaining your free Oni Genji skin are easy! Download Heroes of the Storm: it’s free! Earn your Genji Oni skin, spray, and portrait on both PC and your linked battlenet accounts on PS4 and XBox One! As a bonus, you’ll also get the bodacious Zarya character unlocked in HotS. But wait! There’s even more! Play 30 games with a friend and receive four additional unlocked heroes in HotS: Auriel, Greymane, Kerrigan, and Li-Ming as well as Orochi Hovercycle Mount and a 30 Day Stimpack to boost your XP! Finish this all by January 4th and you’ll be playing both games in style! According to Blizzard’s promo, “play at least 15 Heroes of the Storm games in Co-op vs. AI, Quick Match, Unranked Draft, or Ranked,” in order to claim your rewards! Get those clickin’ fingers ready for some Nexus fun and dive on in to the exciting world of Heroes of the Storm! Even if you’ve never played before, it’s definitely work trying out because hey! It’s free! Plus, you know you want that wicked sweet Genji skin. Do we really need another reason to love Blizzard? *Updated with corrected time frame; despite the image, Blizzard specifically states on their website this event begins on the 15th, which is Tuesday/Patch Day.